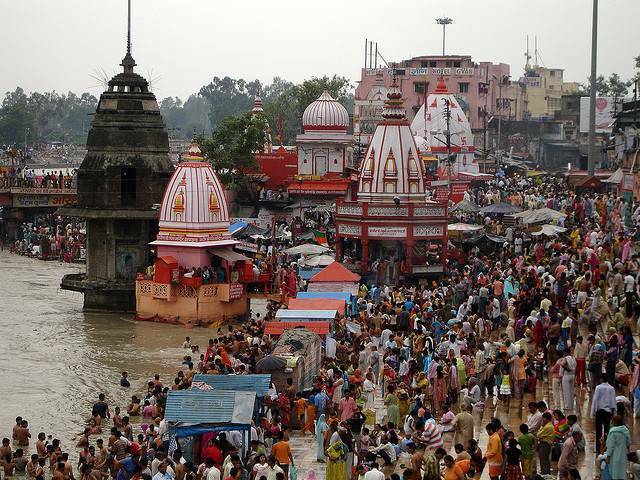 Har-Ki-Pauri (means “Steps of Lord Shiva”), is the most important Pilgrim Center in Haridwar. This main Ghat is the place where the “Amrit” (elixir of immortality) is spilled from the pitcher when carried by celestial bird, Garuda. As per Hindu Mythology, Lord Shiva and Lord Vishnu both visited Bhramakund in this ghat in Vedic time. The place sees the footfalls of minimum 100 devotees every day. The festivals like Kumbha Mela (takes place once in 12 years) and Ardh Kumbh Mela (takes place every 6 years). This ghat is located at the point where the Ganges enters the plain after leaving the mountain. It is believed that a dip in this ghat will washes away every sin committed in this life. Tourists should not miss the “Ganga Aarti” which is performed every evening during sunset. The priests will have huge fire bowl in their hands and their lips spills out the slogans while the gongs are started ringing in every temple nearby Ghat. People on both banks of River Ganga leaves lighted earthen diyas and flowers in the river. The glittering lamps and flowers coat the surface of river with golden color. This entire spectacular scene will definitely uplift one’s soul and body. Do catch the Ganga Aarti in evening, it's a sight to behold.